Alex Lieberman, Founder and CEO of Morning Brew, a free daily email newsletter covering the latest news from Wall St. to Silicon Valley. Alex is a former Morgan Stanley trader and is a Forbes 30 under 30 entrepreneur. This story is about one question that changed everything for me. First, some background. I’m originally from a New Jersey suburb (about 50 minutes west of NYC), and grew up in a Wall Street household. My dad was in Finance. My mom was in Finance. My grandpa was in Finance. Dinner conversations in the Lieberman household bounced between stories on monetary policy, the spread on mortgage bonds, and single-name stocks (that’s what you talked about with your family, right?). And for the first 20 years of my life, I wanted to be just like them. After all, business was in my blood. Fast forward: I had just started my Senior year at the University of Michigan (this was the Fall of 2014), and had been lucky enough to arrive on campus with a Finance job secured upon graduation. It truly was the culmination of a lifelong dream. But having this job was both a blessing and a curse. I was happy. But I was bored. Like really really bored. Two classes wasn’t cutting it, and filling the rest of my day with Mario Kart wasn’t exactly fulfilling. I began helping other students prepare for job interviews as they re-recruited for full-time jobs. I worked with ~75 students and each chat would be centered around a mock interview. I would play Investment Banker, they would play college student looking for an Investment Banking job, and we’d simulate as if it was the real thing. To start every mock, I’d kick off the convo with ice breakers and “lay-up questions”; a simple exercise to help my interviewee shake their nerves. Things like what is your favorite book or why are you interested in finance were always in the rotation. Dozens. Hundreds. THOUSANDS of hungry students were dedicating so much time to launch their career in business, yet they had no content that (actually) engaged them with the business world. I was a finance guy. What could I do? I had no editorial background. No creative skillset. But I didn’t care…I needed to do something. I needed to give them something better. Enter, Morning Brew — business news without the bullsh*t.
Can you share your story of Grit and Success? First can you tell me a story about the hard times that you faced when you first started your journey? Nothing about this journey has been easy. Some challenges are more difficult to overcome than others, but building your first business is a non-stop grind. The first major challenge within the business was related to the content. It’s pretty simple. I was a sh*tty writer. That’s a pretty tough spot to be in when you’re trying to launch a media business that has a team of one. But like anything else, I was excited by the challenge and knew that purposeful practice would make perfect. Aside from writing (and writing…and writing), I surrounded myself with any great content I could get my hands on. Email newsletters. Long-form blogs. Autobiographies. Podcasts. It didn’t matter. I’m a firm believer that mastery is achieved through a combination of ability, effort, and osmosis, and I approached becoming a writer with this attitude. After a while, I became a good writer, but not a great writer. Which is why I’m extremely lucky and thankful to be surrounded by an all-star editorial crew. They are GREAT writers. Where did you get the drive to continue even when things got hard? Through loss, I learned the power of perspective. A week before starting my Junior year of college, the unthinkable happened. My dad (and my best friend) passed away suddenly. He was 49 and in perfect health. There was no warning. No time to say goodbye. One minute he was there, and the next he wasn’t. The finality of it was surreal. Shock turned to sadness and sadness to anger. While grieving, all I could think about was my dad and what he would want for my mom, my sister, and me. I knew how much he cared for his family and how nothing mattered more to him than our happiness. Once the intense grief subsided, the emotion that took its place was appreciation; an appreciation for the incredible moments and memories associated with him. My dad was such a special person, and I attribute so much of my success to his love and mentorship. This truly changed my perspective around everything in my life. It may sound cliche…but it’s the truth. I gained a clarity and focus that grounded me in the few things that truly mattered: family, friends, and building things that help others. Whether it be a long day at work, a hire gone wrong, or simply the exhaustion of the entrepreneurial rollercoaster, I’ve learned to remind myself of what I’m truly fighting for. There hasn’t been some dramatic turnaround at Morning Brew. But it has always been a grind to grow our audience and convince people why we should be taken seriously among a group of century-old incumbents. Which is why a new subscriber today feels just as good as a new subscriber two years ago. And while it’s exceptionally frustrating & exhausting at times, an unyielding belief that we are making an entire generation’s experience with the business world 10 timesbetter, makes it all worth it. We’ve 10x’d our audience from this time last year, grown our team from 4 to 12, and grown our number of brand partners from 4 to 60. New products to come in the next 2 month. a) Operate outside of your comfort zone. I believe that one of the biggest killers of creativity, progress, and personal growth is comfort. Comfort is easy. Growth is not. Prior to Morning Brew, I had never sold anything in my life. I didn’t take a sales class in college nor did I spend any time in a Fortune 500 sales development program after school. Fast forward 2 years — I have learned the art of selling and storytelling. I manage three other sellers and have secured and negotiated dozens of deals well into the six figures across 60 clients. This isn’t the product of good fortune or an uncanny ability to sell. It’s a very simple formula. Know the goal (in this case building great relationships with brands) and know the steps to reach it (understand the product, the audience, the client, the industry, etc). Then work at it tirelessly. b) Everyone should gain experience in sales. Sales touches every part of my job, every single day. I sold investors on why business news is broken, why Morning Brew is the solution, and why they should trust us with their hard-earned money. I sell new hires on why Morning Brew is a fast-growing media rocket ship that they should climb aboard. I sell brand partners on why they MUST get in front of Morning Brew’s audience and how we have become the gatekeeper to our readers’ attention and trust. But sales isn’t just about learning how to effectively storytell in a way that educates and persuades. Sales is also about rejection. It doesn’t matter how long you’ve sold or how good you are at selling, you will be rejected…A LOT. Placing yourself in an environment of inevitable and repeated rejection forces you to develop grit. c) Surround yourself with others that have grit. Like creativity, grit is a muscle. It can be practiced and worked at, and it will strengthen over time. If you believe you don’t naturally have grit, put yourself in an environment filled with those that do. My dad. He truly was everything I could have asked for in a teacher and best friend. He prioritized family and emphasized integrity. He expected so much of me, and even more of himself. He found success through extreme resilience, but never flaunted it to others. I could fill this entire page with stories of his wisdom and guidance. But what is most illustrative of his impact, is the extent to which he helped me long after he passed. He was gone one year prior to the inception of Morning Brew. This fact is both crushing and amazing to me. It’s crushing because Morning Brew is the culmination of all that he taught me. But he never got to see it. Which is also why it’s amazing. I’ve come to realize, he equipped me with a lifetime of lessons that have been key to overcoming each roadblock and rejection along this entrepreneurial journey. When Brew’s first employee quit, I was devastated. He taught me to have resolve. When I was deciding whether to quit my corporate job for Morning Brew, I was ambivalent. He taught me how to weigh risk and reward. When I started managing people, I felt utterly unqualified. He taught me how connect with and respect others. I wouldn’t consider myself successful yet, but I do believe Morning Brew is bringing a lot of good to this world. Here’s why: We sit at the intersection of media and business, both of which touch just about everyone on this planet. This affords us the opportunity to drive meaningful impact, but also carries immense responsibility. Media influences literally everything that we do. It drives our thoughts, our interests, our actions, our conversations, our views of the world, our relationships…I could go on. 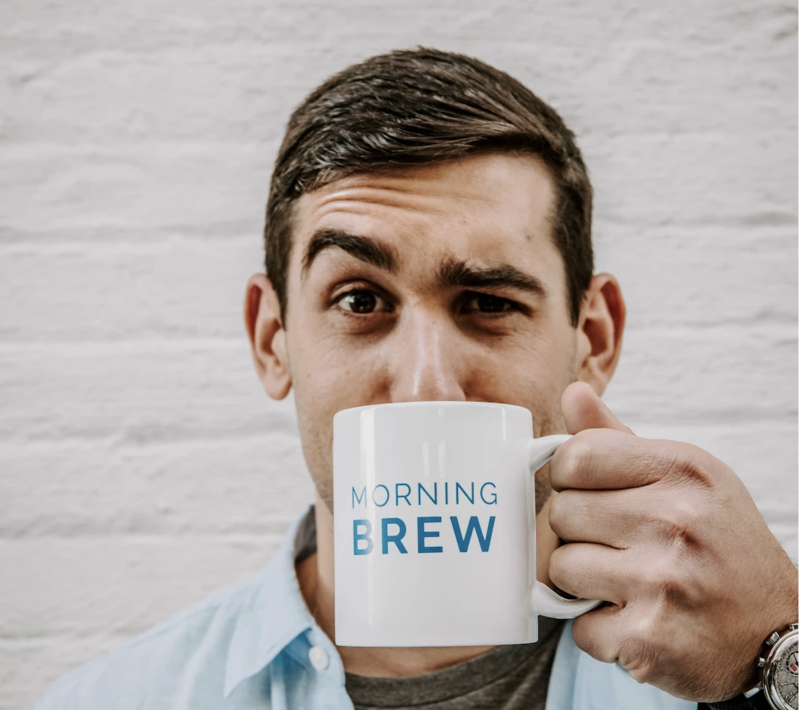 While Morning Brew is just one tool in a consumers ever-growing media tool kit, we take incredible pride and responsibility in delivering meaningful, relatable, and trustworthy content to an entire generation. And then there’s the business world. Whether you work in Investment Banking, audit a Macroeconomics lecture, or need to take out a mortgage, business is ubiquitous. Moreover, we have the privilege of educating and engaging millions of hungry, young professionals on a daily basis. These people will lead companies and change societies for the better in the next decade. That is humbling, exciting, and frightening all at the same time. Not at the moment. I’m always working on Morning Brew. Even when I’m not in the office working on it, I’m stilling “working” on it. It occupies most of my waking hours and about all of my mental capacity. That said, when I ultimately get the opportunity to step back and breathe, I want to help change the narrative around homelessness through a new media property. Similar in format to a Player’s Tribune or Humans of New York, this brand would provide a platform for individuals experiencing homelessness to use first-person storytelling to build stronger and more educated relationships with readers. Show your employees just how much you care about them through consistent and concerted effort. Don’t just say you’re their biggest cheerleader. Show that you’re their biggest cheerleader. Remind yourself (or literally set reminders) to celebrate the little wins, whether it be a great piece on Tesla, a successful sales call with a prospect, or a killer on-air interview with a TV network. But remember, employees appreciate genuine appreciation. Don’t fake it for the sake of it. You must also remember to push your employees. Appreciation is great, but if it’s not complemented by thoughtful feedback and constructive criticism, you’ll ultimately fail your employee as a manager and mentor. Pushback shows you truly care and want to help your employees be the best version of themselves. Make sure to be as diligent about giving feedback as you are about celebrating wins. You are a person of influence. If you could inspire a movement that would bring the most amount of good to the most amount of people, what would that be? You never know what your idea can trigger. I want to end homelessness. Everyone should have the opportunity to feel like they’re living, not just surviving. The fact that over 500,000 people go through each day without the security of a roof over their head, clothing on their back, and meal on their table is simply unacceptable. “If you can’t fly then run, if you can’t run then walk, if you can’t walk then crawl, but whatever you do you have to keep moving forward.” — Dr. Martin Luther King Jr.
It’s relevant in everything I do. I’m not the smartest in the room, but I try to be the smartest worker in the room. I attack the day with enthusiasm and don’t back down to uncertainty or poor odds. Facing adversity is all about perspective, and I maintain the perspective (and confidence) that adversity is a speed bump, not a stop sign. I don’t do twitter or Facebook. But, I am a Linkedin fanatic. Connect with me on LinkedIn. I try to post daily, and my content spans from conversation starters to stats that make you go wow. Also, feel free to follow Morning Brew on social (namely, Instagram and Twitter) for business news without the bullsh*t.